Way back when I started this blog, I wrote about clichés, and specifically the expression, "It's not your grandmother's [insert item here]." Yesterday, I read this in an article: "I use the 'grandmother' rule. Put simply; present anything so that your grandmother would understand it." And today I read this: "You can learn a lot about marketing from grandmothers. And you thought they were just great for baking cookies." I remember both of my grandmothers as hardworking women, employed outside the home, who were physically active. Neither of them ever wore their hair in a bun or knitted a shawl. My mother's mother was still working full time shortly before her death in her 70s and I don't believe she ever baked a cookie in her life. My grandmothers were both intelligent and savvy women, and wouldn't have had trouble understanding anything you could dish out as a speaker. These days, grandmothers are even more savvy, educated and hip (not that there's anything wrong with the knitting, baking, nurturing-stereotype granny). So why allow these stereotypes to persist in your writing or speaking? If I were in the room and a speaker used one of these clichés, I'd have a pretty hard time listening to anything else he said. And imagine all the grandmothers in the room who he'd be insulting. Be careful how you stereotype people in your presentations. We're (for the most part) pretty sensitive to gender, ethnic and religious stereotypes these days, but there are some groups out there that it's still considered okay to make fun of or treat as though they're some sort of myth rather than real people. The only thing that grandmothers all have in common is that they're women who've had children who've had children. Period. Great post, Lisa, especially the part about tuning out when a speaker hits a particularly sour note. Wouldn't it be revealing (and distracting) (and enlightening) if we could see people's thought bubbles as we spoke? It would sure change the course of a presentation . . . I'm not going to defend the use of tired cliches. Like most speakers, I am guilty of using cliches occasionally, and I'm always thankful when someone points it out. It's a habit I try to avoid. However, I'm not sure I agree with the suggestion to avoid using imagery or analogies to help convey a concept on the chance that someone in the audience doesn't share the same perspective on your chosen analogy. If we all eliminated every such figure of speech from our repertoire, we'd all be using dry, dull, and boring language. Speakers (or writers) should be encouraged to select words that pack images. Using the word "grandmother" in a speech evokes an image. For most people in the audience, this image may include qualities such as strength, wisdom, value-driven, motherhood, hugs, holiday visits, grey hair, old-fashioned values. You can build your story or analogy around any of those qualities. Is the image perfect? Perhaps not. Is the image created identical for every audience member? Certainly not. This article includes an photograph of a woman who, given the title of the article, we assume is a grandmother. It's there to evoke an image in our minds of our own grandmothers or other grandmothers we know. Do all of them need glasses? No. Do all of them have grey hair? No. Do all of them have warm smiles? No, unfortunately not. Despite this, the image makes the article stronger. The previous comments are interesting too. Should we, as speakers, choose our words so delicately that we never set off any thought bubbles in our audience at all, because we want to avoid the negative ones? Yes, we all need to be careful not to feed negative stereotypes, but we also need to balance that with the need to incorporate rich imagery and analogies in our speeches. Andrew, I definitely don't think anyone is saying that we should bend over backwards not to trigger negative thought bubbles in our audiences. Why, just the other day I got into hot water because my language was, let's say, too colorful and evocative. The stereotyped grandma that I'm rebelling against is not the "strength, wisdom, value-driven, motherhood, hugs, holiday visits, grey hair, old-fashioned values" grandma. If that were the case, it probably wouldn't bother me so much. 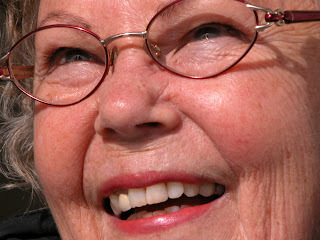 I'm referring to the constant repetition of a negative stereotype which portrays older women (whether they have grandchildren or not), as uninformed, foolish, empty-headed, behind the times, physically unattractive, and with little to offer those of us too sophisticated to appreciate a warm hug, cookie or knitted shawl. And by the way, where's the overused negative grandpa stereotype? Maybe this one bothers me the most because it's reserved for women. I love this, Lisa! I'm turning 60 in July so I've become more sensitized to dismissive phrases like the grandmother one. I look ten years younger, feel 29 and act somewhere in between. I attribute it to a lack of sensitivity or awareness on the part of the speaker. A gentle correction by you or another audience member would be a gift. Thanks for your comment, Jane. You do look much younger than your age! I think it was Ezra Pound that said that a cliché is a dead metaphor: a cliché is a truism that has lost its original context and the life behind the phrase. I feel that using clichés generally comes across as inauthentic, which is a bane for any presenter. Thanks, Terry. I acknowledge that it's hard to escape clichés. Using them is an unconscious habit for most of us! Lisa - thanks for calling me on this. I took the Einstein quote not to mean that a grandmother couldn't understand, but if you are speaking to a grandmother, esp. savvy ones such as yours and mine, you need to explain it without buzz words, without jargon or assumptions, you need to explain it to someone who may have a different frame of reference, and who is willing to listen, and even willing to ask questions to understand. Explain it so that someone who isn't in that field of expertise will understand you. But from your blog post, you see that use of the term grandmother as derogatory, which I had not brought to it. Good food for thought. Glad I'm following you on twitter.